Don’t drink and drive. A message the Air Force — as well as organizations all over the United States — have been saying over and over to make the message stick. If you find yourself without a ride at night, the new “Wingmanship” app may be able to help. Created by Airman 1st Class Hwansung Kim, 43rd Logistics Readiness Squadron, the free Android mobile app provides functionality for “calling a wingman, finding a taxi, hotel, calling the base directory or an emergency contact,” Kim said in a release. 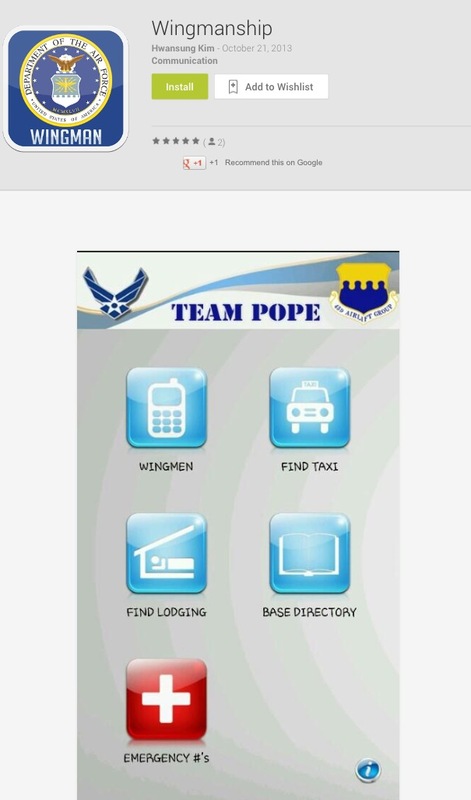 The app is available for airmen at Pope Army Airfield, Fort Bragg, N.C. The app is intended to find you a local taxi service within 20 miles of your location; find local lodging for the night, also within a 20 mile radius; provide important contacts available in the base directory; provide emergency numbers in an urgent situation; pinpoint your location and send it to others. “The app has the ability to send your location [through a SMS text]to your ‘wingman,’ allowing them to know where you are if you need a ride,” Kim said. Kim started developing the app last June and finished it in August. He is currently developing an Apple version, a similar wingman app for Buckley Air Force Base, Colo., and Fort Bragg soldiers called, “Battlebuddies,” that he hopes to have finished later this year. The Pope Army Airfield first sergeants awarded Kim with their Diamond Sharp award, recognizing him for his innovation and leadership to assist fellow Pope airmen and their families. Download the Wingmanship app for Android here.